Samousades (singular samousas), is the Spartan version of baklavas and is made in a similar way we make Tsipopita”or Daktyla, in Cyprus. The only difference is that they are rolled into a thicker roll and whereas Tsipopita and Daktyla are always made with almonds, in samousades you add sesame seeds and other nuts, such as walnuts, pistachio etc, and more spices. Samousades, which date back to the Byzantine period, are traditionally made with hand made phyllo and are fried. The following day they bathed in a honey syrup and set aside until they absorb the syrup. Its name is derived from the word sesamum, se-samum, anagrammatized to samu(m)-se, samusas, because of the sesame used in the filling and on top of the dessert. I did not have time to make homemade phyllo from scratch but as I had some store bought phyllo at home, I decided to recreate samousades with it, same way as I make baklavas. When making samousades with the store bought phyllo it is better to bake them. 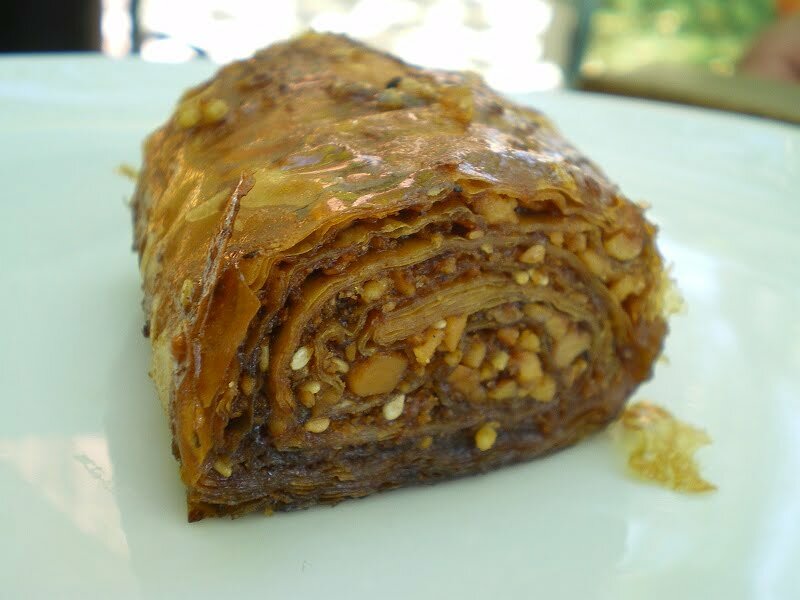 Samousades is the Spartan version of baklavas and is made in a similar way we make “Tsipopita” in Cyprus, the only difference is that they are rolled into a thicker roll and whereas Tsipopita is always made with almonds, in samousades you can also add walnuts, pistachio etc, and more spices. Chop the walnuts, almonds and pecans, and add sugar, cinnamon and cloves. On low temperature, (or in the microwave) heat the butter until it melts an then clarify it. On your working surface spread the phyllo sheet and brush with butter. Continue the same procedure with 4 phyllos and then spread one third of the filling on the whole surface of the sheets and roll the smaller side into a cylinder. Repeat with the other phyllos and place in a buttered tin. Brush samousades with butter and wet your hands and sprinkle a few drops of water on top. With a sharp knife cut into about two inch pieces. Bake in a preheated oven at 180C until golden brown. Prepare the syrup. Put all ingredients in a pot and bring to a boil. Remove froth and simmer for five minutes. Discard orange peel, cinnamon stick and cloves. Add lemon juice and turn off the heat. When it is still hot with a spoon add syrup on top. I Wish you my friends a New Year filled with hope, prosperity and good health! Incredibly tempting and ever so scrumptious! A real delight! Happy New Year, dear Ivy! I love baklava and that looks just super! Have a Blessed 2009 my dear friend. Boy does that look good! I LOVE baklava and that picture is making my mouth water. I hope your new year is full of good friends and good food! Wow awesome rolls. Happy New Year to you and your family dear. Have a wonderful New year celebrations Sis!!!! I wish I were there in Athens celebrating with Samousades and lots of raki and excellent Greek wines!!!!!!!!! !2009 promises to be an exciting adventure!!!!! Oh, my goodness, that looks like a SPLENDID way to welcome the new year! Happy New Year, Ivy! I’ll be there before you and it looks like it’s going to be a great one! Delicious Ivy! This is one I def want to make. Happy 2009! That looks really delicious, Ivy, like all of your gorgeous creations! Happy New Year! That looks awesome! I am a big fan of baklavas. Our very best wishes for a healthy and happy new year!!! Oh my goodness, this looks amazing! I’ve never seen it rolled like this! I love, love, love baklava. Thanks for sharing. I love baklava and this looks like the next logical place to take it. I just showed my wife and this definitely goes on the to-do list–it looks incredible! I hope you and yours had a happy holiday and new year! Ivy, Xponia Polla and hgeia. I’ve never heard of this dessert but your rendition has me wanting some NOW! This looks delicious! Desserts are not my specialty, but this looks so good I definitely have to try it! OMG, those look positively decadent. I adore baklava, so know I’d love these. Why can’t foods like this not be low calorie!!! Samousades is very delicious food my all family members like it!